Transitions® Lenses are Photochromic lenses or lenses that change from light to dark based on U.V (Ultraviolet) light intensity. Transitions ® lenses are the most popular brand when it comes to photochromic lenses, and in many cases other photochromic lenses brands are mistakenly called Transitions® Lenses. The basic technology of photochromic effect originated from molecules of different compounds of silver or organic photochromic molecules that are embedded in, or cover the front surface of a photochromic lens. These molecules are transparent to visible light without significant ultraviolet component, such as indoors artificial lighting, but when exposed to ultraviolet (UV) rays as in direct sunlight, the photochromic molecules undergo a chemical process that causes them to change shape, absorb a significant percentage of the visible light, and become darker. The process is reversible; once the lens is ‘relocated’ away from the source of UV rays, the photochromic compounds return to their transparent state and the Photochromic lens becomes clear. Transitions® Lenses are the most popular, because historically they performed better than the other Photochromic lenses. Transitions® lenses are more sensitive to U.V light therefore are getting much darker, and convert from clear to dark faster than most brands available today when exposed to UV light.Another important quality of Transitions that the speed of conversion from clears to dark is almost twice faster than some other brands that could take as long as 10 minutes! 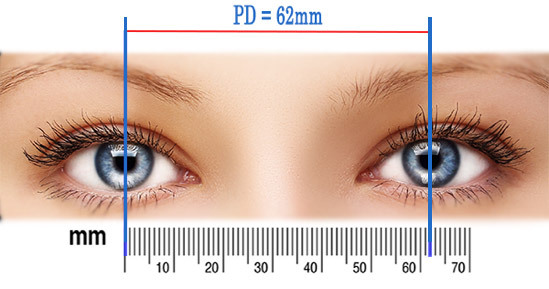 By now you probably imagining entering dark room right from bright sunlight and waiting 10 minutes to be able to see clearly.And last, Transitions having minimal residual color or the basic lens color when the photochromic material is not activated, that could be as low as 2% or as high 30%. Transitions® lenses are the main brand name, but under this brand Transitions® had developed few more products to accommodate a more unique clientele.The second most popular brand by Transitions ®, is Transitions Xtra Active ®. This brand of Transitions® lenses convert darker than a basic Transitions® and can respond to light as well as to U.V intensity. This means that even though most glass windows today are protected from U.V, such as our car’s windshield glass, the lens will change to dark (to some degree) and help us see better in high light situations. 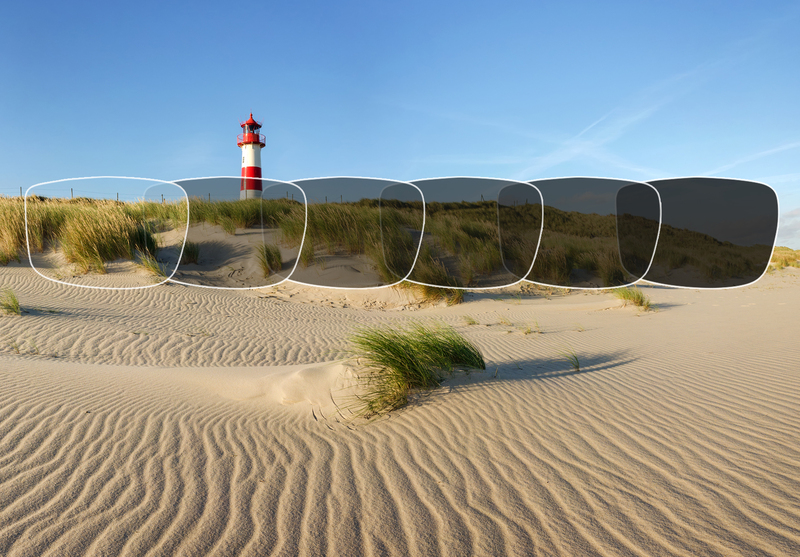 This said, Overnight Glasses still believe and support polarized lenses to be the best lens when it comes to sun protection as they block glare and give the user a better and crisp vision. As we just mentioned polarized lenses are the best at sun protection, which probably brought Transitions® to develop two more Transitions® lenses; the Transitions Vantage®, and Transitions Drivewear® that was developed together with Younger Optics. Both of these Transitions® lenses are polarized and show better performance in sun protection.Transitions Vantage® is a clear lens that actually turn to a polarized lens when in contact with U.V light. 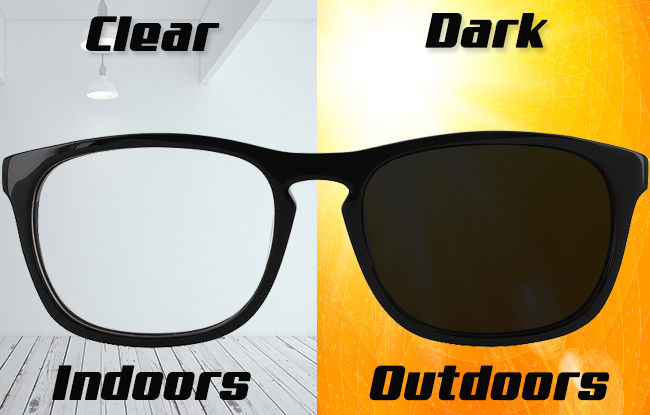 Transitions Drivewear®, are light polarized yellow lenses that turn darker in the sun. Neither of these lenses are sold on the site, but if you do wish to have such lenses, please email us at [email protected] and we can give you a quote. Although Transitions® lenses are having the best performance, they tend to cost more than other photochromic brands. In order to accommodate price conscious clients we also offer our in house brand of the photochromic lenses. Our photochromic lenses show very god performance in all above mentioned categories and we consider them the second best option to Transitions lenses®.